A journey to the Sea of Cortez—to paddle and dive, to hear the island speak, to look carefully, to write, to come home sunburned and transformed. The historians may call this a failed expedition. For the first time, we didn’t complete a circumnavigation of Isla Espiritu Santo, an accomplishment that usually entails 50 miles of epic paddling in sea kayaks so loaded with food, water, and gear that it takes eight students to lift one. 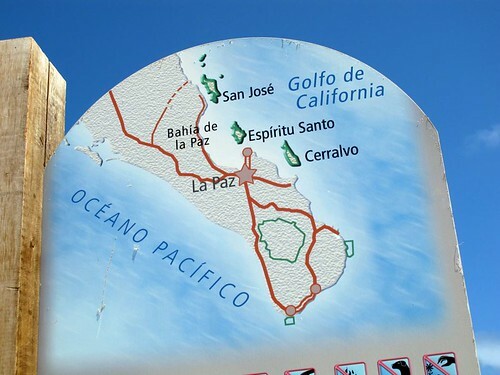 But in March 2010 it was not to be; El Norte, the bully of the Sea of Cortez, had nearly blown us off the beach, and we’d had to remain on the lee side of the island, roaming the canyons and diving the reefs because we couldn’t safely kayak the windward swells. And yet, these students not only managed to learn a thing or two about Baja’s natural history, they managed to go about the business of learning in such a way that they became the tightest community of any class with which I’ve worked. The reflections below, taken from my field notes, are an attempt to figure out what went right, so very right, during an experience that had all the underpinnings of a pedagogical disaster. Click below to see additional pictures from the Baja adventure. I sit on a wide bench of metamorphic rock, worn smooth by a creek known as El Chorro, which translates, literally, as the torrent. A seven-meter waterfall cascades into the pool where my feet dangle, and a nine-meter waterfall exits the pool below. The students are supposed to be writing at this point; the two-word prompt I’ve assigned them says, Describe water. They are distracted, however, by the discovery of a cape water snake swimming in a stagnant pool some 20 meters behind me. Despite its endemic status, it’s a fairly nondescript snake it looks like what a garter snake would look like after swimming through an oil spill but it commands a certain respect among the expeditioners because they’ve heard the tale of how one of these snakes bit a member of last year’s expedition. I’m hoping they also remember that it only bit her after she grabbed its tail. One of them asks why the snake is hanging out in the stagnant water rather than the clear water nearby. Look at what this pool has that the other pool doesn’t, I answer. They look, my budding naturalists, and then compare, and finally discover that tadpoles are only to be found in the stagnant pool. Even then, it takes a few moments to make the connection that, for a cape water snake, tadpoles are lunch. This is why I keep dragging students to Baja. Down here they learn when they focus and they learn even when they’re distracted. I don’t really need to tell them to write just to pay attention. Sea stars: During a tidepooling session, students compare two Pycnopodia helianthoides. One of the things I like about our expedition is the accidental scarcity so many of us are experiencing. One student forgot to bring toothpaste, another forgot sunscreen, and yet another left her hat on the airport shuttle. But we’re on an island now, a desert island, and the nearest mercado where replacements could be procured is too far away for anyone to swim. So we inventory, and we discover that we have extra hats and sunscreen, and enough toothpaste, collectively, to brush everyone’s teeth for months. Here on the island, our scarcities might help define our community. If nothing else, we learn that there’s plenty to go around if we share despite the fact that every expeditioner’s personal belongings are limited to what fits into a single 20-liter dry bag. Over the top: On a day when it was too windy to paddle, students lug snorkeling gear over a ridge to a cove with some stellar diving. We’re pinned to the beach, at least for the morning. It blew all night, each new gust throwing a handful of sand against the tents. El Norte. I can’t imagine any of us slept. I sure didn’t. We knew this was coming, and before bed we’d briefed the expeditioners to pack up their tents at first light, but that order has been canceled, and we’ve planned a diversionary hike across the ridge to a lee shore where we can get some diving in. When the first two kids got out to help with breakfast, their tent almost blew away. It’s the first time in four expeditions the sand anchors haven’t held, and we spent a half hour hauling rocks so that the tents won’t wander off once their occupants do. The guides hope the wind will die down as the day heats up, but I’m not feeling it. When K. asks why it was blowing so much, I remind her of the meteorological theory we’d discussed in class, but she seems skeptical that an atmospheric high centered so far north could create this much wind so far south. I offer the alternative theory that sometimes the gods are offended when people whistle on boats. She wants to know who whistled. Rock flip: The SCU varsity tidepooling team at work. Katy’s hair tells the story of how windy it was that day. While preparing guacamole, B. threw an avocado pit into the cove where we are now camped. L., the other member of the guacamole crew, scolded him for this, bless her heart. Two hours later, I’m diving with several students to help them complete a field exercise, and I come across an almost-spherical, smooth, somewhat hard object at the base of a coral head where A. had reported seeing sea horses. I spend a full 90 seconds examining this biological oddity before it occurs to me that it’s not of aquatic origin. The students I’m working with decide not to include the avocado pit in their survey. They reason that it’s not supposed to be here, so it’s not really part of the natural history of this cove. Playing the natural philosopher, I reason that it was transported here by members of the animal kingdom primates and that in actuality it has become part of the natural history of this cove. We fail to achieve consensus, our discourse once again a victim of the nature/culture dualism that plagues all my classes. Worse yet, I never spotted one of A.’s sea horses. We got a break this morning, and an early start, departing the beach with high hopes that we might fit two days’ worth of paddling into one and get this expedition back on track. Kelly, the world’s greatest teaching assistant, shuffled a few crews in the double kayaks to spread out the stronger paddlers, and as a group we were suddenly fast. What energy these kids have! Everyone wanted to take a hike during the lunch break, so C. and I stayed back on the beach to make tuna salad tostadas so we wouldn’t lose too much time. I was pleased to translate the dozen Mexican cans I opened and discover that it was all dolphin-safe tuna. Because of the group’s energy we decided that we ought to be able to make it to Ensenada Grande, where our permit prefers us to camp tonight. It was close, and I spent our last hour on the water fretting about how low the sun was getting to the horizon. Of course, the students thought it was cool to be kayaking into the sunset. I thought I’d have to push them a bit, once we hit the beach, to stow the boats, get their tents set up, and set up the kitchen, but they fell to it like troopers without needing much prompting from me. We had dinner going by the time darkness fell, at which point I realized that the only tent that didn’t get set up was mine. Field research: It was hard to tell whether we were investigating the sea lions, or they were investigating us. My writing session is interrupted by the morning news. In camp last night we had a babisuri, a nocturnal mammal from the raccoon family. It chewed through the mesh of B’s daypack while she watched, enraptured, from within her tent. Now that’s a nature lover! And we had ghost crabs on the beach after moonset. The students who slept, tentless, just above the high-tide line describe the crabs to me as if I’ve never seen one, but the details are exquisite: the translucent sheen as they tiptoe sideways over the sand, the single oversized claw, the way the eyes move independently on their tall stalks. I tell the beach campers that the only thing better than encountering nature is when it encounters you. El Norte isn’t howling today, but we’re doing a lay day anyway to snorkel Los Islotes with los lobos del mar. (I love the fact that sea lions in English become sea wolves in Spanish.) I’m hoping the seas will calm down enough to slip around the north end of La Partida tomorrow, but the guides are not brimming with their usual Mexican optimism. We’ll take it as it comes. I must remind myself, again, that this expedition’s motto is Todos bien. It’s all good. Headlamps engaged: a necessity for finishing the daily writing prompts. Some students crank out more than 100 pages of field notes during their time on the island. Dolphins! On the sabbath! I think we’ve all found religion. We were near La Mascara, rafted up for photos and snacks, when S. spied a pod of some 20 dolphins feeding about half a kilometer away. I blasted after them immediately, and the entire tribe paddled behind without any need to be urged onward. Within 50 meters I signaled for quiet, please, and we coasted toward the pod without paddling. A big part of the cetacean experience is hearing an animal breathe through a blowhole, especially if it’s actively feeding, as these dolphins were. You can’t imagine the amount of air exchanged in one quick exhalation/ inhalation cycle until you’ve heard it close up. And here they were, all around us, breathing. We could smell their fishy breath. They were so engrossed in their dinner that they ignored our presence completely. An awed silence ran from student to student as we drifted together. No swish of a paddle, no cameras clicking, not even the sound of a faculty member spouting off about how dolphins can renew an astonishing 80 percent of their lung capacity in a single breath. The moment was absolutely reverent. Sun and sea: Author John Farnsworth confers with biologist Elizabeth Dahlhoff. I still find myself being surprised by this island’s secrets. This morning a student screamed after she stepped on a tiger snake eel, Myrichthys tigrinus. I’m not certain which animal was more frightened, the student or the eel. I attempted to herd the eel into the water with the blade of my paddle, but the eel had other ideas. Mouth wide open to advertise its trophic level, the eel tucked its tail into the sand and began to burrow. Backwards. Ten seconds later, it was gone. Damnedest thing I ever saw! I turned back to the students, several more of whom were now holding paddles defensively. Okay, compañeros, I say, this is our last chance if we’re going to circumnavigate. Let’s get these boats into the water! About two kilometers past the spit we got into some pretty big seas, and the wind hadn’t even come up yet. I started to wonder why Manuelito wasn’t giving the signal to abort, and then a wave broke over B’s boat, sweeping her sideways into my boat, drenching us both. She braced like a pro, and when I turned around to give Manuelito the turn-around signal, he was already giving it to me. When we finally tucked back in behind the spit, once again sheltered from the worst of the wind, we stopped to allow people who had gotten water into their boats to pump out. I asked Manuelito why he waited so long, and he smiled before quietly explaining that he was wondering why I did. This is my fourth trip with Manuelito, and I know him well enough now to realize that he’s as heartbroken as I am that these kids aren’t going to get to paddle the windward side. But they sure aren’t moping about it. Indeed, they’re all trash-talking about how I haven’t got a chance in tomorrow night’s poetry slam. In the evening, once the dishes were dry, I asked B. what it was like to have a wave break over her boat. Her reply: What wave? Amigos del Isla: One of the course requirements was for students to be prepared to give mini-lectures on elements of Baja natural history. Here Silas Strickland ’10 waxes eloquent. Last night, just before twilight, M. and A., who were wading at the far end of the beach, came back to camp with news of a large eel they’d seen swimming around the shallows. The behaviors they described were so completely contrary to anything I know about the local eel population that I had a hard time believing that they’d actually seen one. Trumpet fish perhaps? Or an immature billfish? Maybe it was too dark to get a really good look? This evening, just before dinner, cries of Eel! Eel! resounded through camp. Within a flash the entire expedition assembled on the high-tide line, walking slowly down the beach while a two-meter-long moray eel swam alongside us in the shallows. Green. There was no question, at this point, that the initial identification had been correct. But since when have morays begun to hang out in the shallows of the intertidal zone far from any crevices in which to hide? One of our guides knew the answer to this puzzler. It turns out that another local guide, one who works for a less reputable outfitter than our own, has been training the moray to come into the shallows by leaving it chicken gizzards whenever his group camped on this beach. I should apologize for ever doubting M. and A’s original report. We’re seeing more epipelagic species this year, especially mobula manta rays. Could this be a function of El Niño? It’s been our custom to stop and observe the spectacular leaps of the mobula, especially when whole schools of them are playing around, but this year there are so many that we keep paddling lest we never achieve a destination. I’ve seen less evidence of coral bleaching this year than last, and the population of osprey continues to grow. Thank you, Rachel Carson! I’ve noticed more trumpet fish but fewer triggerfish, which indicates that human predation continues to be a problem, even in these protected waters. While we still are seeing a spectacular array of tropical fish, the only large fish left in these coves are the ones we humans don’t eat. I should be careful of my critiques of human predators, reminding myself that, back in the dark ages, I used to bring along a spear gun whenever I’d visit the Sea of Cortez. Yikes. Tandem jump: The world’s greatest students demonstrating how worn out they felt by the time the sun went down. It’s this expedition’s final morning on the island as I write this. This is our first windless morning, and I can smell the mangroves from my tent. I notice, for the first time, that mangroves on a calm morning smell the same as the inside of my dry bag after a week on the island. With maybe a hint of sulfur? The canyon wrens in the cliffs behind us are far more distinct when El Norte isn’t howling. Their trills, a descending spiral that I’ve always found as hard to describe as to imitate, command me not to spend so much time away before I return to the island. Some of the students want to come back with me next Christmas. When I point out that this is not going to be a school trip it’s going to be a family trip with my nephews they point out that we’re all family, now that we’ve spent a week on the island. C. and J. are both planning to have the island tattooed to their feet when they return to Santa Clara. I wouldn’t bet against them doing it. And the expeditioners have made plans to form an intramural softball team once we’re back on campus. Hop to it: Instructors never know what will show up in the students’ field notes, or in this case, on the student’s field notes. In the clear, flat water today, with the wind finally abated, we saw two green sea turtles, a basking swordfish that was every bit as long as my boat, and a blue whale breaching in the distance. The swordfish actually let us catch up to it, but the sea turtles dived some 20 feet beneath our boats, still visible in the clear water. It’s like the rainbow after Noah’s flood: Nature seemed to want to kiss and make up after having allowed El Norte to abuse us. For a group that didn’t get to see the windward side of the island, we’ve excelled in terms of awe and wonder. One student wrote in her notebook about a half hour she’d spent stalking a parrotfish, finally deciding that, because of its lips, the parrotfish is the Angelina Jolie of the fish world. This same student, while wrassling with a writing prompt that asked her to compose a natural history of her body, wrote: If I shook out my hair, I could fill a small aquarium. The secret to being a good writing instructor is to realize how little someone like me can teach a collegiate junior or senior about writing. I try, of course, because it’s my job to do so. I tell them that the descriptions in their notebooks should be more vivid than the images in their cameras. I tell them they must pay attention to the details everyone else misses. I tell them that good writing is about learning to make decisions, and that deciding what to leave out can be just as important as deciding what to include. I train them to smear ink on paper even when they can’t think what to write. But it’s the island, ultimately, that teaches them to write. It seduces them, it causes them pain, and it embraces them. It can amaze, it can frighten, it can mystify. And when they put pen to paper in an attempt to describe the experience, ink flows. Year after year, the students discover that if they listen, the island speaks.